With the increasing use of smartphones, a watch doesn’t seem to be an item the young have much time for (excuse the pun) – everything they need or seem to need is on the phone. In fact when I was visiting a sports centre recently I doubt if I saw a proper watch on a wrist of any of the kids there – but they were instead virtually surgically attached to their smartphones and I wondered if they were unlucky enough to have an injured thumb – well I don’t know how they’d survive the day. I mean if they’re not texting, like, they gotta be dead right? Now I did see a few wrist accessories of some kind, but very few were watches as such, most being simple bracelets and wrist decoration of some kind. Actually quite a few were strings, leather straps and thin ropes – quite ethnic really. However on closer inspection I did find out that a few, a very few had watches after all. Not that timekeeping was the core function of wearing them, because they were the simplest of quartz watches, costing perhaps at most a £10 note maybe. These were basically for novelty value or perhaps promotional items and most with printed pictures on the dial. wrist wear’, that co-incidentally told the time, though I did find one that was made of wood with fixed painted hands – so time was not of the essence there! 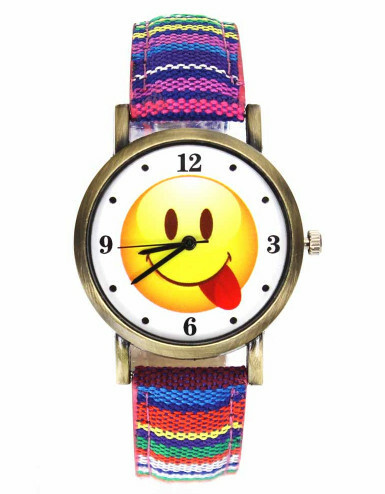 Now this is not the preserve of the young and I too have a novelty watch, I wear sometimes just for fun. 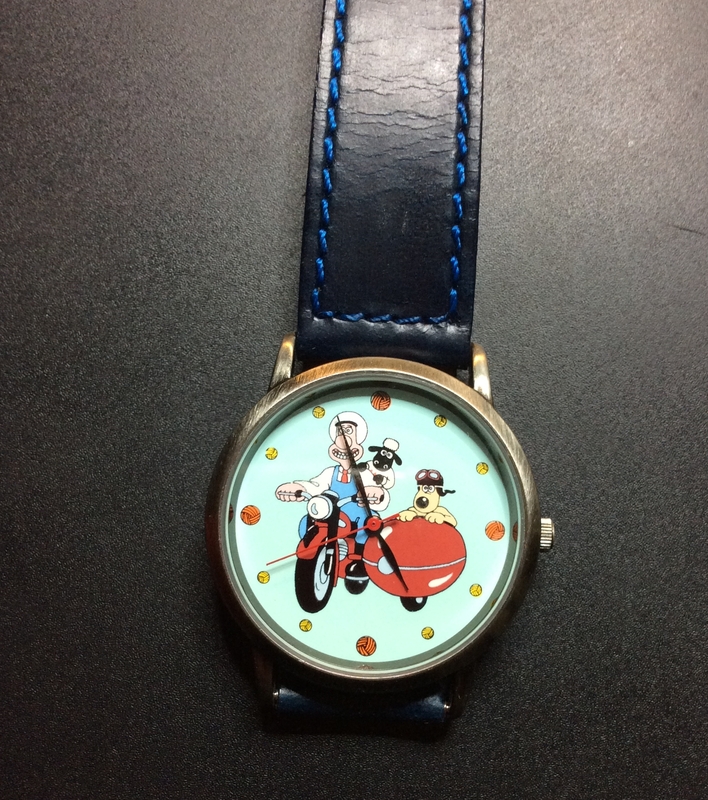 Mine is a Wallace & Gromit watch, from the short animated films fame. Why? well I just love the films and I’ve even got a bow tie to match! Silly I know but at my age, at the other end of the spectrum, I can get away with it. So here’s a couple of these novelty watches I like the look of – purely as decorative items, but these ones do tell the time. 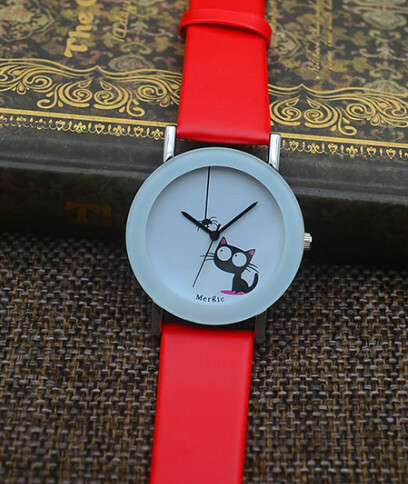 I particularly like the Mergic “Cat” watch, basically as it’s such a clear dial and with the high color straps really looks pretty cool – I understand that’s what the young set want – to look cool I mean. As the norm mostly all these types of watch are produced in huge quantities in China, but what’s new – even the mainstream watches if not made completely in China tend to dominate the supply of quartz movements today, whatever the Brand of watch. The cost? well around £10-£12, though I’ve seen one or two at auction for silly prices upwards of £40! And no they are NOT worth that kind of money at all – not for simple novelty – but they are fun to wear if you like them.